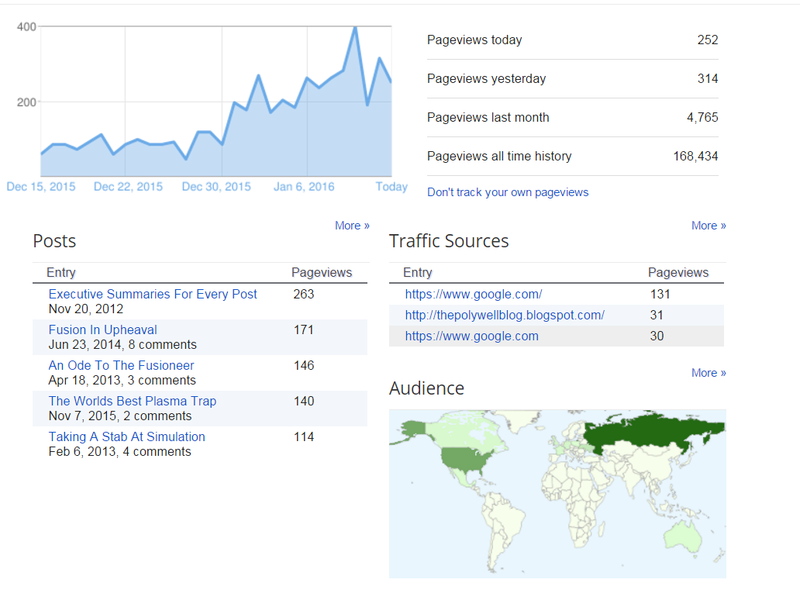 The blog has now received 168K page views. Yet we still do not know if the polywell concept will work. We are just going to have keep calling for research dollars until our leaders realize how much potential this technology could be. This letter calls for an overhaul of US federal support for nuclear fusion. It is addressed to Representative Alan Grayson, who introduced "The Fusion Innovation Act Of 2015” into the 114th Congress. Presently, federal funding is narrowly focused on laser fusion or tokamaks, neither of which will be commercially viable. This narrowing has happened because fusion shifted from practical to esoteric research, poorly communicated its’ advancements, lost funding for a diversity of ideas and did not compare all of its' approaches objectively. ITERs’ high cost (~16 to 50 billion USD), size (~23,000 tons of steel), delays (over 7 years presently) and hazards make it unlikely to lead to commercial fusion. NIFs’ failure to get ignition led Livermore to cancel the Laser Inertial Fusion Energy (LIFE) program in 2014. Meanwhile, fusion can be done cheaply by non-specialists, using common tools. Moreover, several outside groups have made progress in spite of a lack of government support, including: Tri Alpha Energy, Energy Matter Conversion Company, General Fusion, the Northwest Nuclear Consortium, Hyper V, Lockheed Martin and Helion. U.S. federal support for fusion must change; changes should start with rating machines using John Lawsons’ original energy balance, not derived metrics like the triple product. Next, the mission of the Fusion Energy Sciences Office, should be both expanded and modified. Congress should refrain from calling for yet another review panel which will wastes time. Funding should be increased for shovel-ready projects such as EMC2s’ polywell (30 million over 3 years) MITs’ LDX (2 million per year) LANLs’ PLX (tens of millions) the dynomak (35 million over 3 years). Additionally, an expanded SBIR program should be created that focuses on fusion startups. Government funding should be closer to venture capital; with a real possibility of losing funding. Finally, the Northwest Nuclear Consortium should be examined as a model for high school fusion education. For example, grants could be made available for high schools to build small fusors. The letter closes with a comparison between flight and fusion.